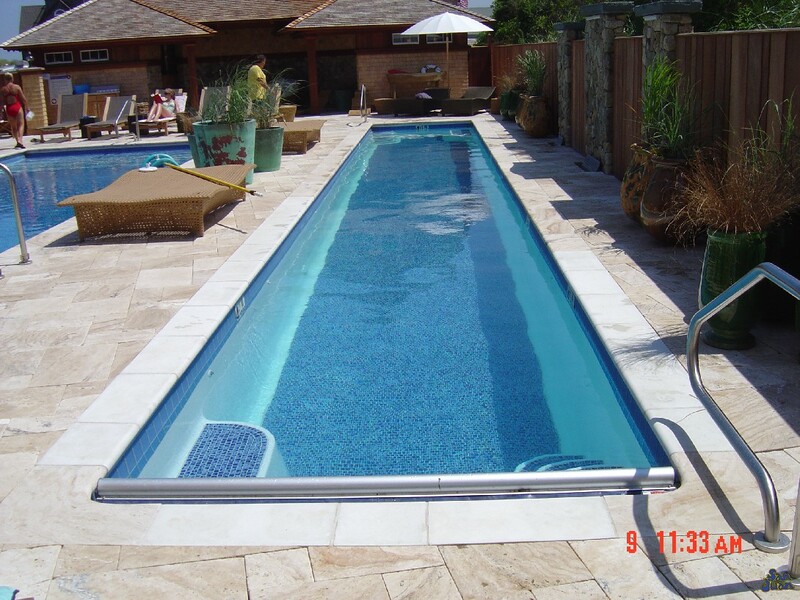 Another gorgeous fiberglass pool is installed by Fiberglass Pool Guyz! 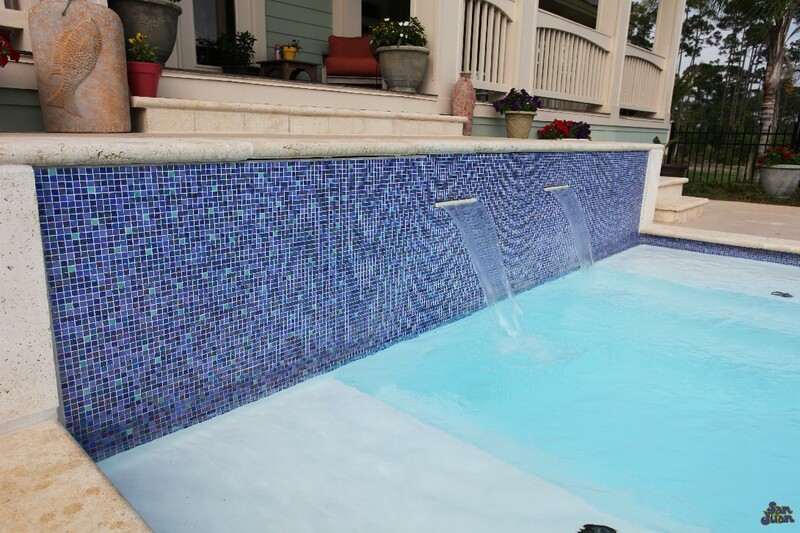 We installed this Seaside Pool Shell in record time. 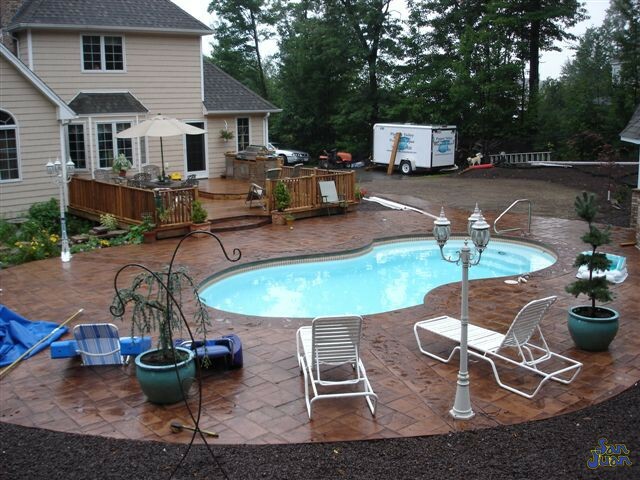 It only took us 7 days from the time that we broke ground to install our swimming pool and pour our concrete deck. Our up-beat attitude and desire to please! That’s a pretty short list but in actually, there are a lot of moving parts. 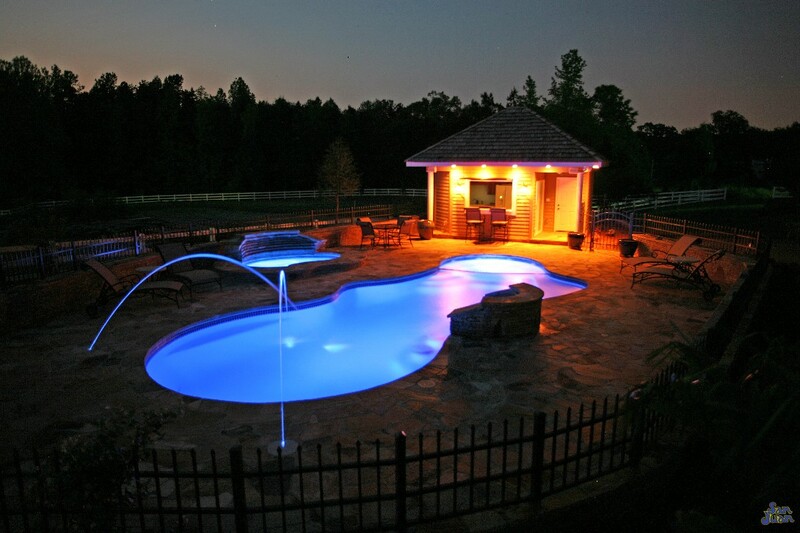 If you’re new to the pool shopping realm – let us recap some very important information for you. 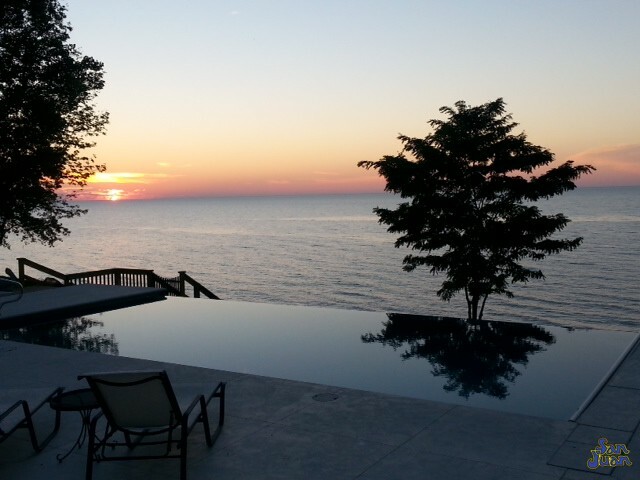 Pool construction with a gunite pool builder is slow… very very slow. 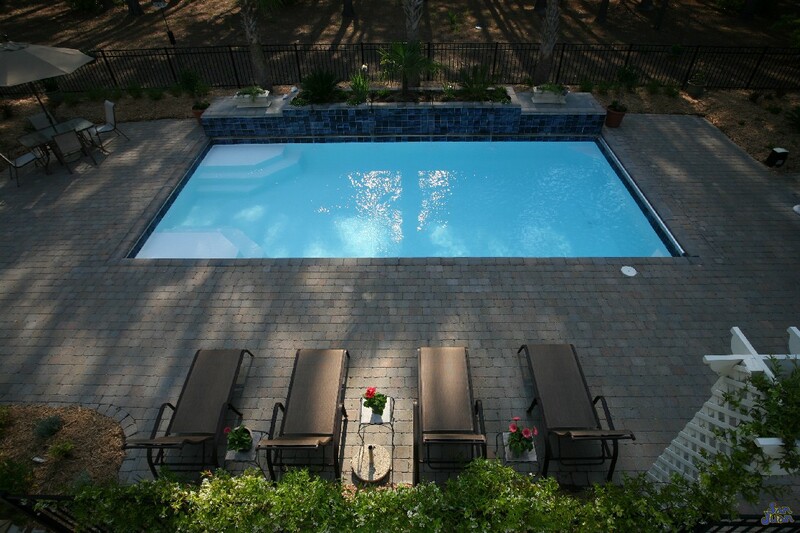 News on the street is that a gunite pool builder may not break ground on a new construction job until mid-October. Now, we don’t know about you… but that’s a little cold for us. 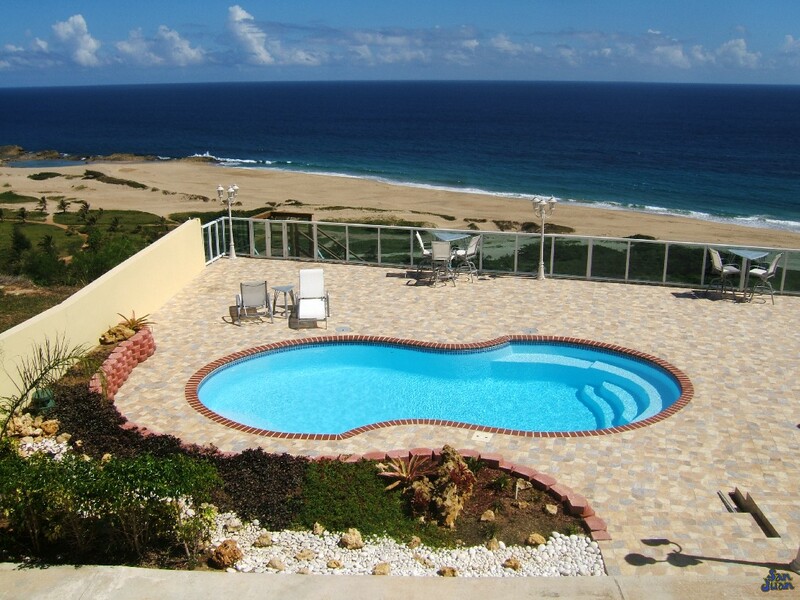 We want to swim now and that’s exactly what we are gonna do! 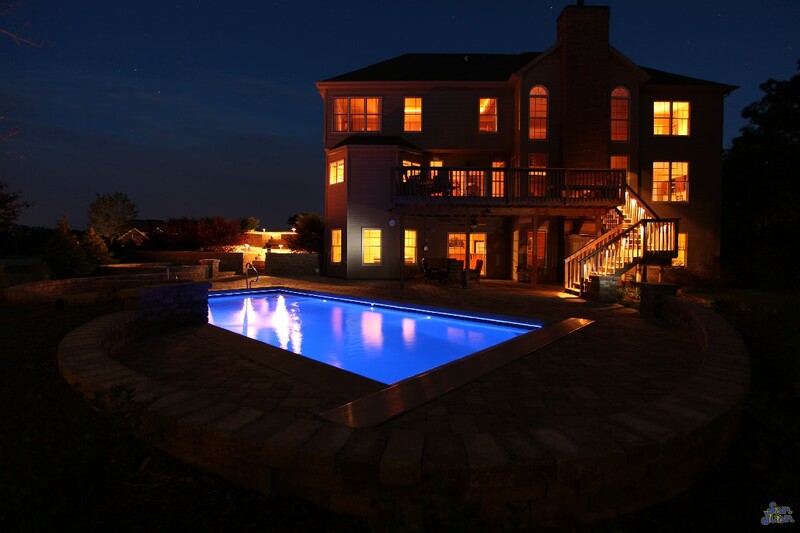 As we just eluded to, installation time frames on a gunite swimming pool are very long. 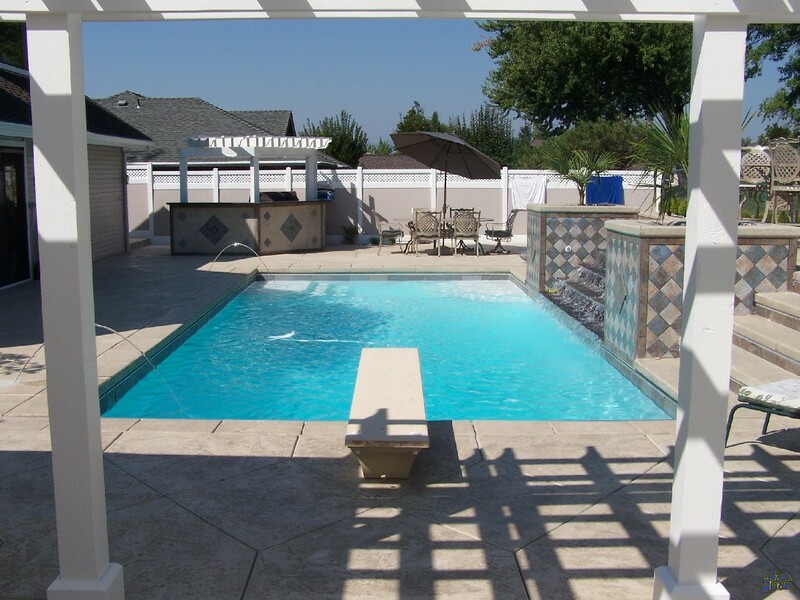 It’s mainly due to the number of sub-contractors that they have to hire and schedule to complete your pool construction. In the fiberglass realm, things run rather differently. 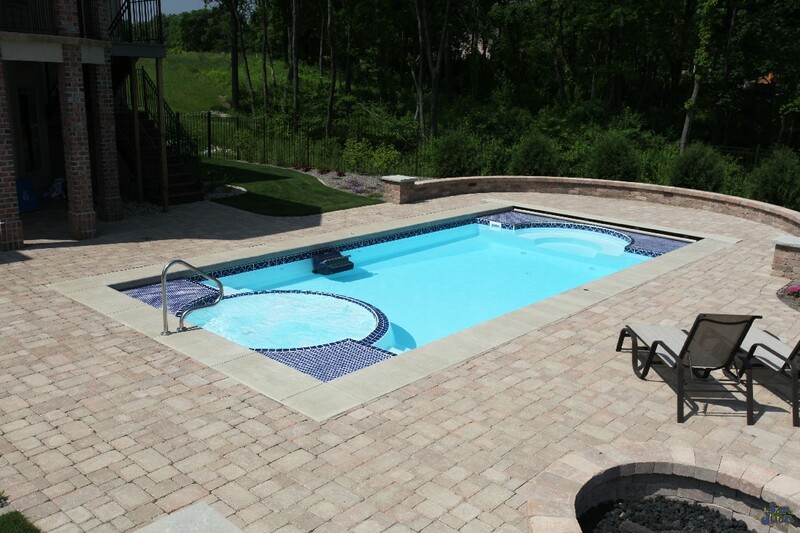 We refer to our type of work as a swimming pool installation, because that is exactly what it is. 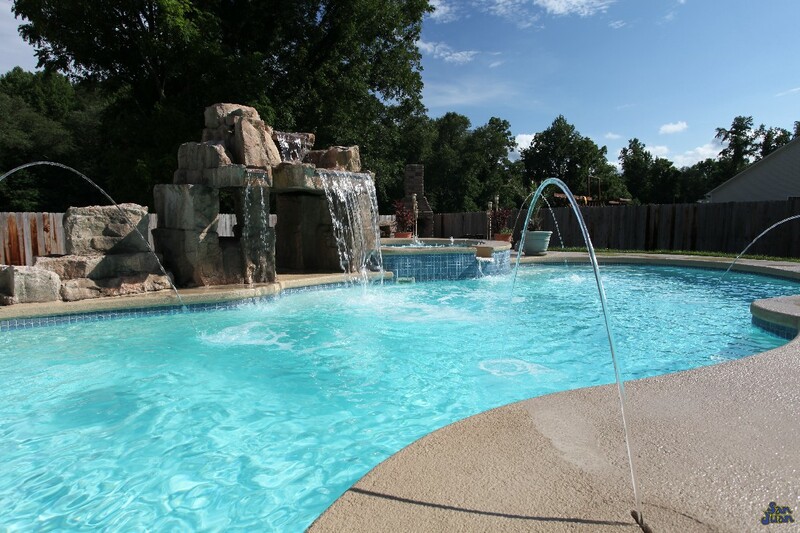 Our fiberglass pools are pre-manufactured in a factory. 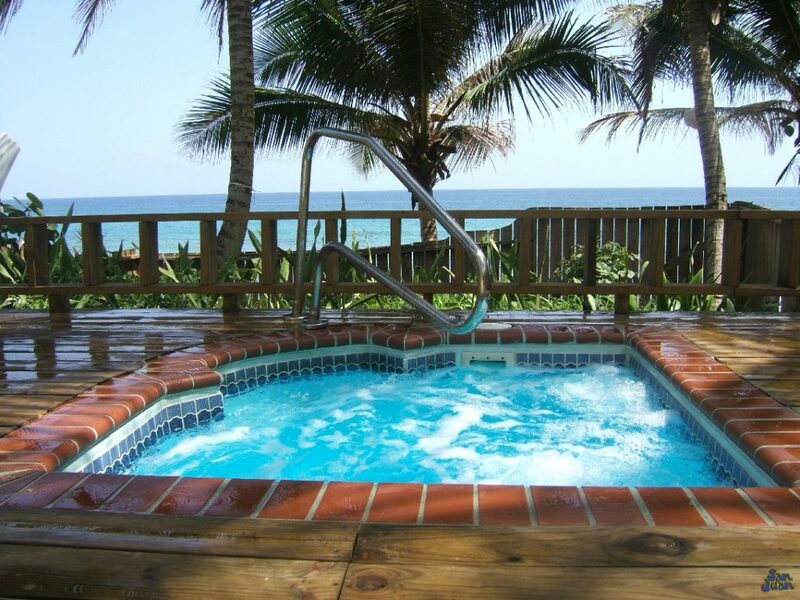 *San Juan Pool’s is our manufacturer – the oldest in the country, by the way. 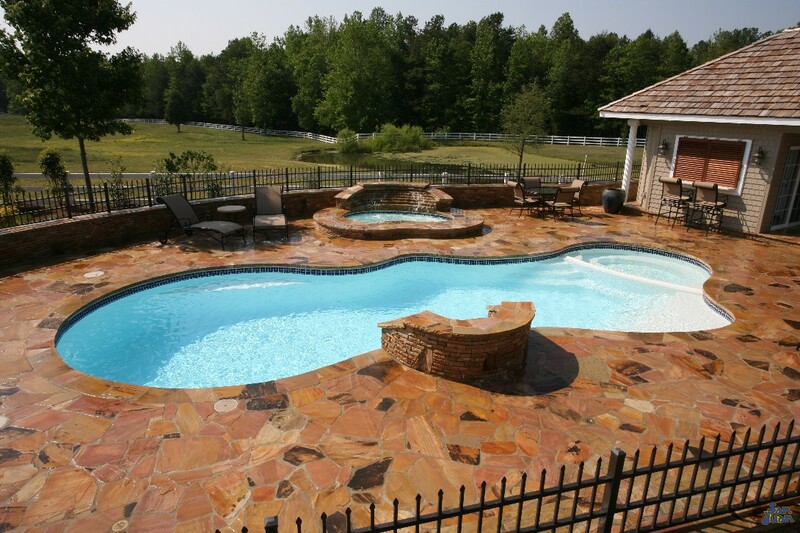 That means that our swimming pools are sitting on the dock ready to ship when an order is placed (or can be manufactured quickly)! Often times, we are running into customers in the field who are elated to find that we can place an order as soon as a down payment is collected. 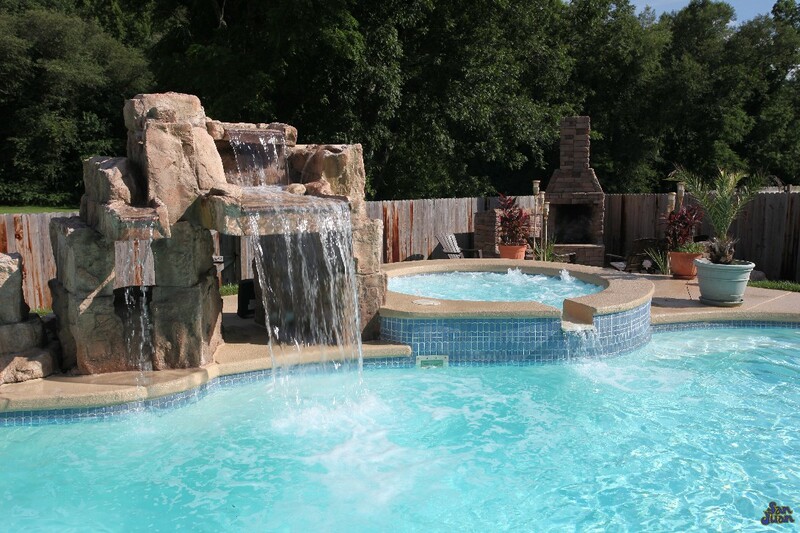 Once the pool is manufactured, San Juan Pools prepares the shipment and we schedule your install date. 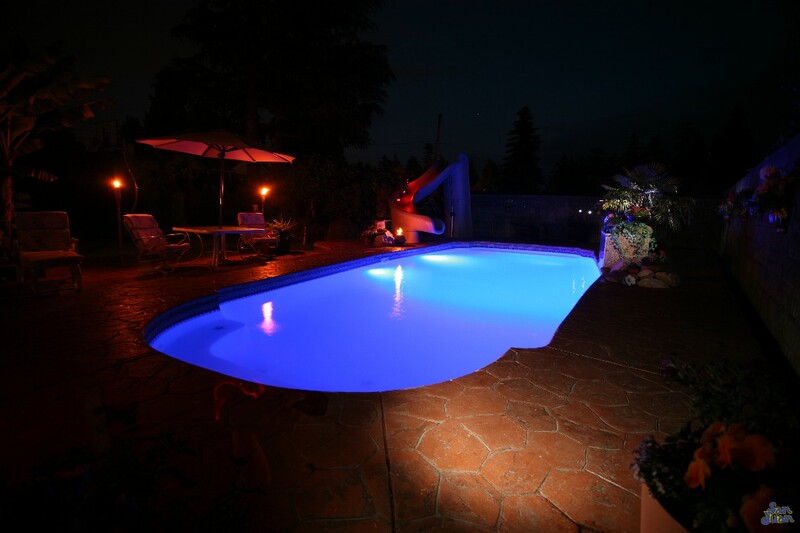 In fact, our installation dates coincide with the same date that your swimming pool arrives. 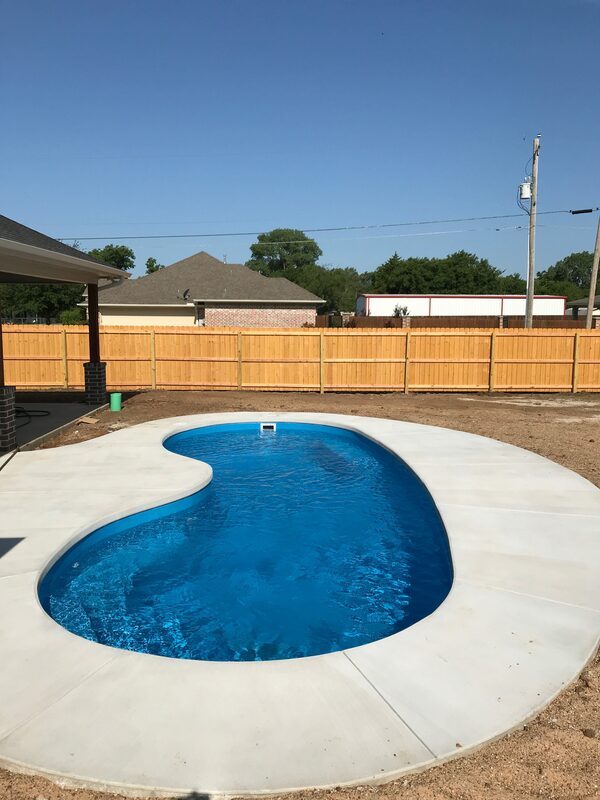 At that point in time, our installation crew (often 2-5 guys) show up with an excavator, dig your hole and are ready to set your swimming pool. 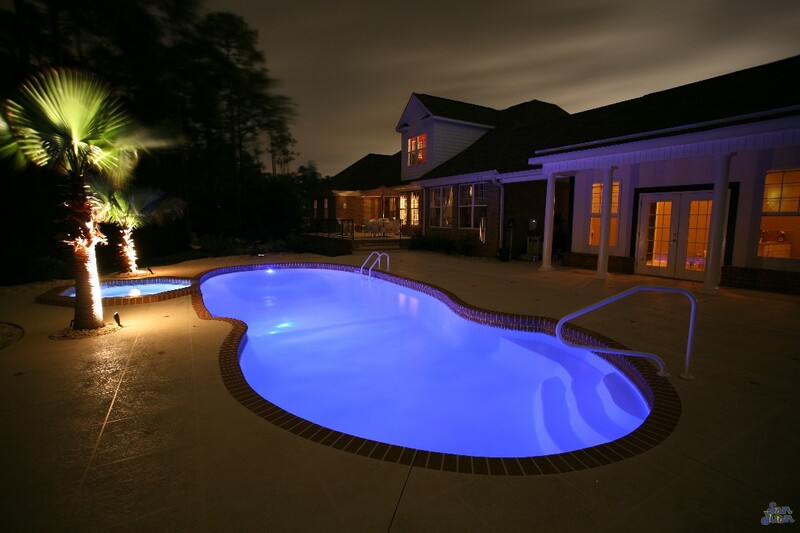 Our teams are lightning fast and our customers are always surprised by how quickly the installation goes once your pool arrives. 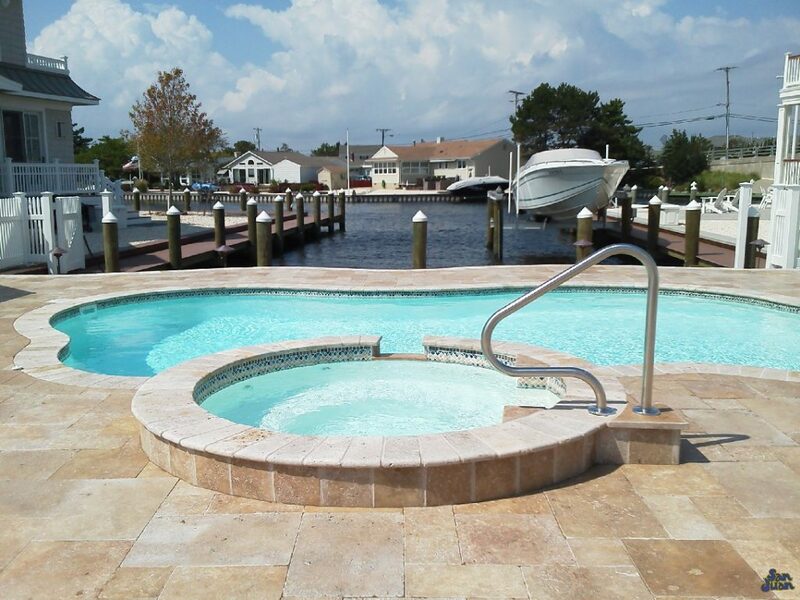 Did someone call for a Seaside fiberglass pool? We suppose this is the correct delivery address… especially since we see a lot of exposed dirt! Alright then, load er’ up boys! 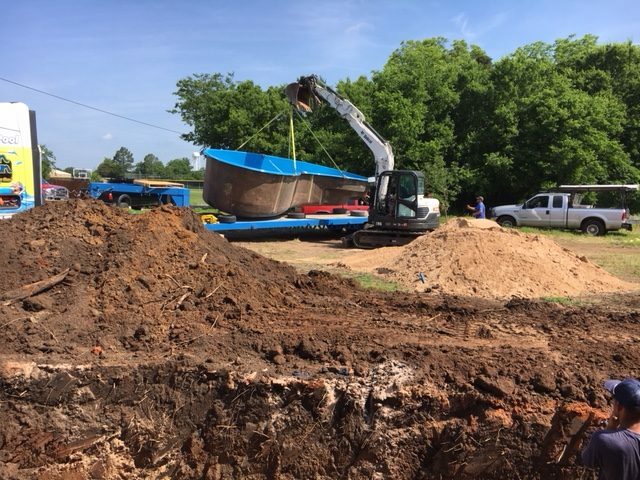 You can see our excavator rig lifting this fiberglass shell right off this flatbed trailer. We are using the same machine that we excavated the hole to set your swimming pool. That’s how things go with fiberglass; we are nifty and very resourceful! 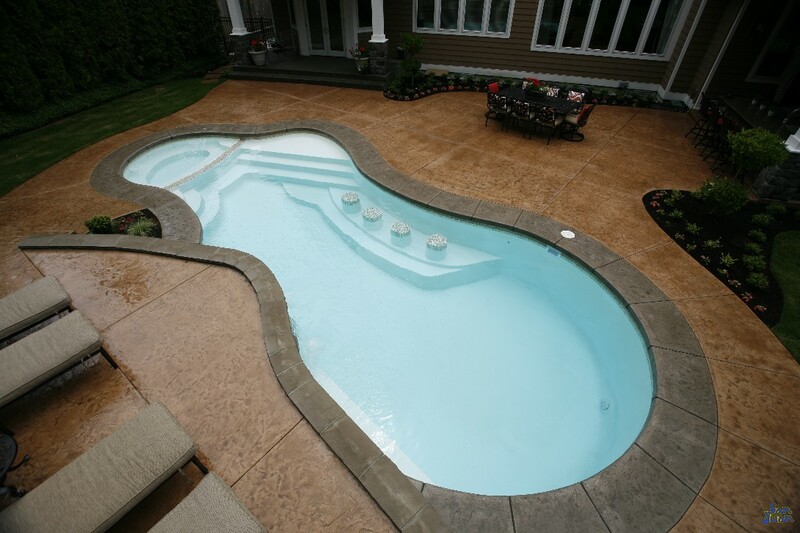 You heard us right – we actually deliver your swimming pool to your home. That means, no slow sub-contractors, loud equipment or long-time messy backyard. Most of our installations are done in as little as 7-14 days and by that point… whoosh! 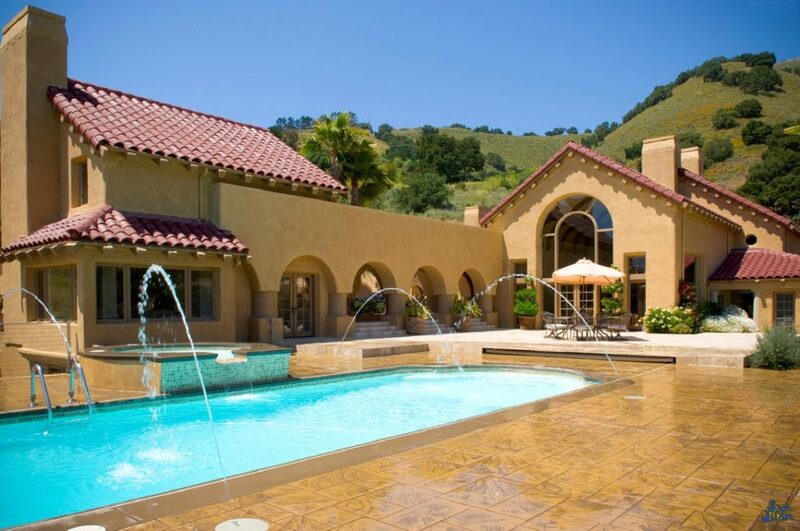 We are out of your hair and you are free to enjoy your gorgeous recently installed swimming pool. 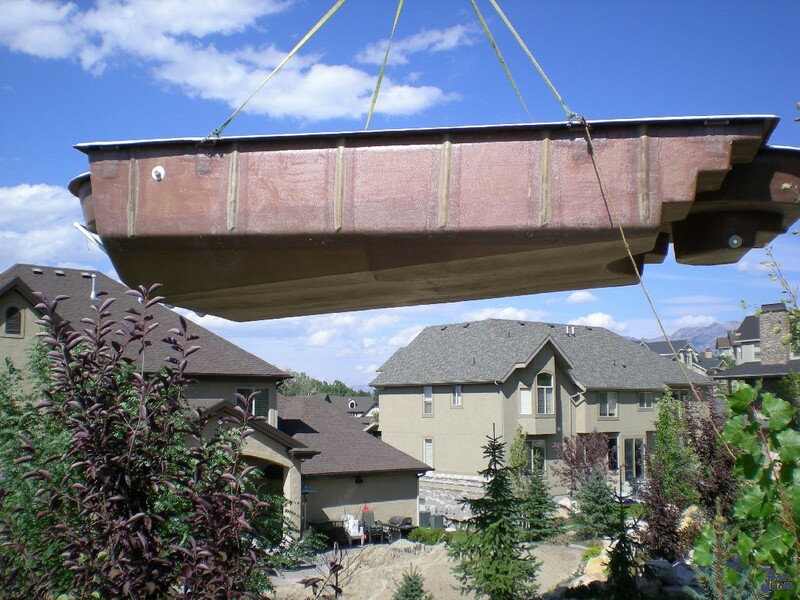 Just watch, now that you’ve read this article, you’ll probably notice a fiberglass pool on the back of a flat bed trailer more often nowadays; especially if you see one going down your local highway. 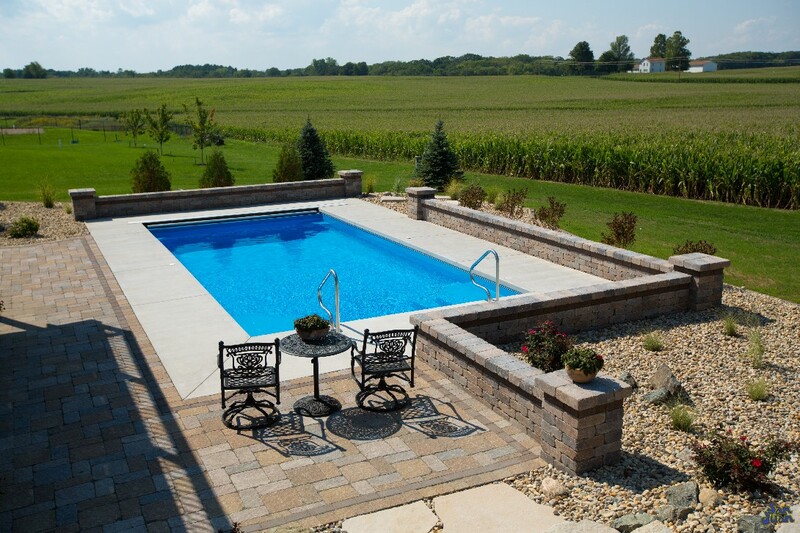 If you do, chances are Fiberglass Pool Guyz are hard at work and doing another install! 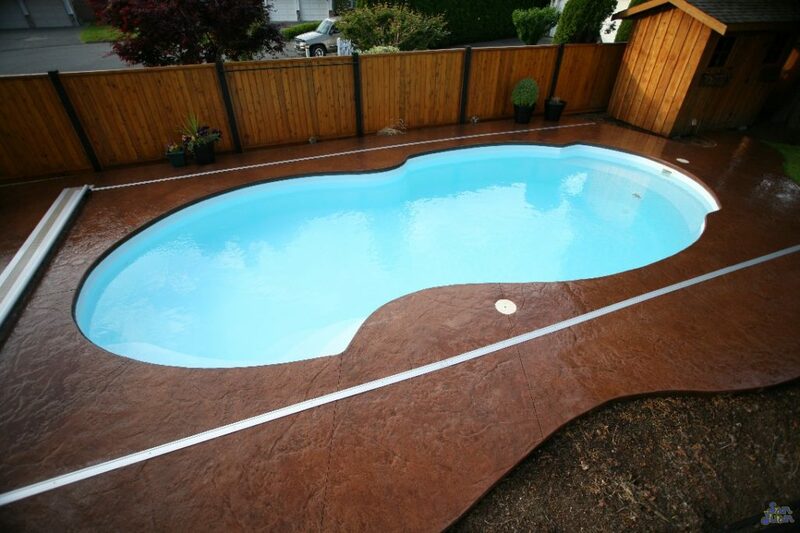 A poured concrete deck is an excellent complimentary tool to any fiberglass pool installation. 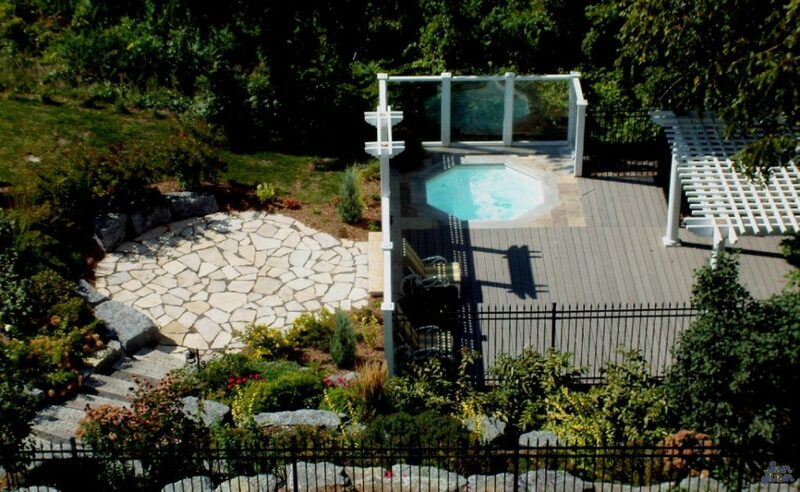 We utilize “Stegmeier Deck Forms” to set a border around our swimming pool. This border forms our concrete and provides a bracing to hold our went cement as it dries. This forms your “coping” and typically takes on a straight edge form. Now then, back to the Tioga Job! 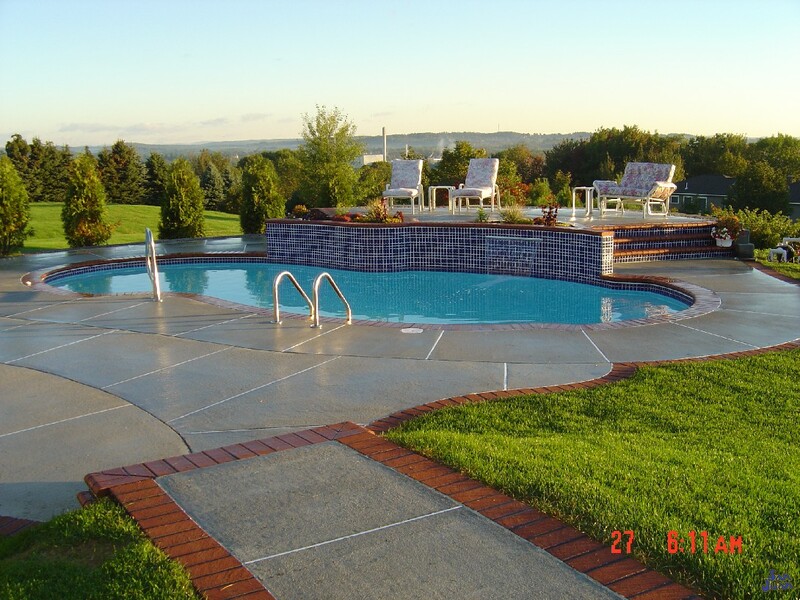 You can see (above) that we included a poured concrete deck around the edge of this swimming pool. 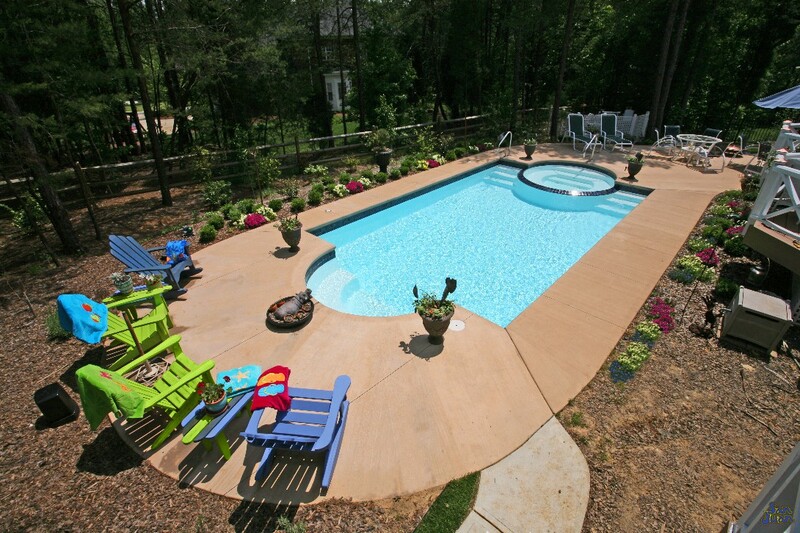 Poured Concrete is an excellent deck type due to it’s ability to be stained, color or treated. We can create a deeper hue to the natural gray color (shown above) or we can give the concrete a whole new look and texture all together. 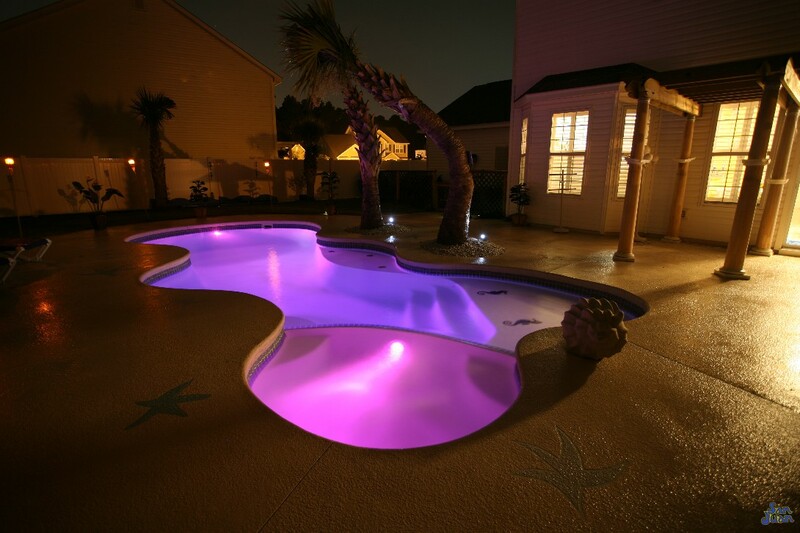 If you’ve been thinking of how you’d like to decorate around the edge of your pool then you’ve come to the right place. 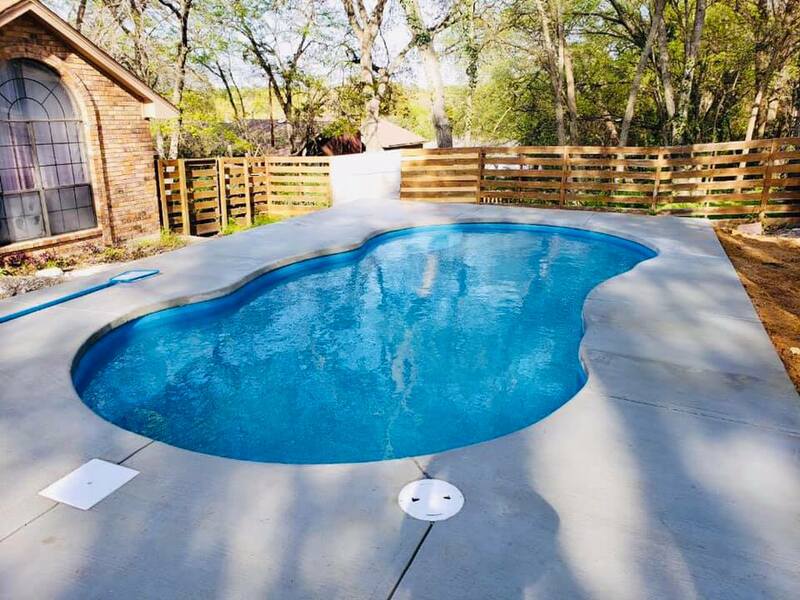 Jim Lugari (our owner) is actually a very well known concrete specialist around Dallas Fort Worth and does a great job with creating some pretty amazing looks. 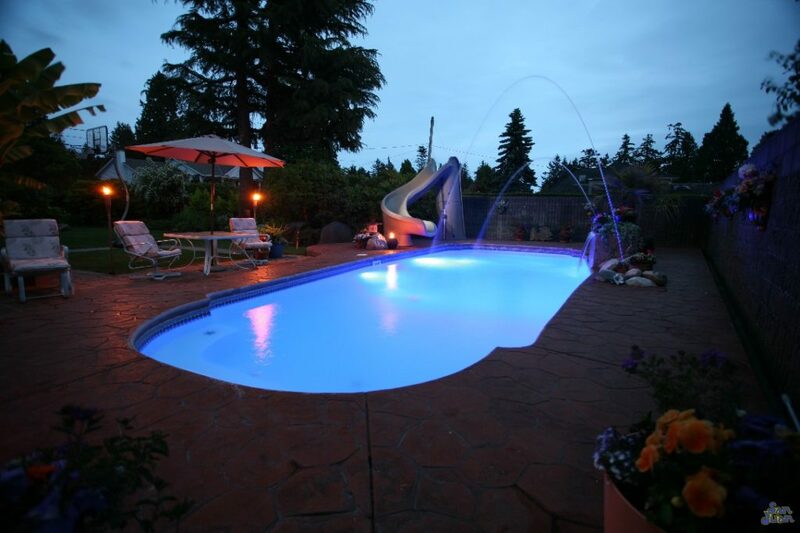 It’s all a part of generating your very own Backyard Oasis for you, your family and friends! 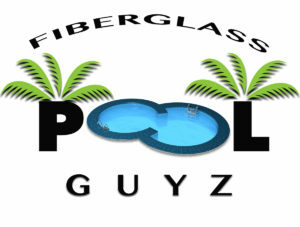 And that’s what Fiberglass Pool Guyz is all about! 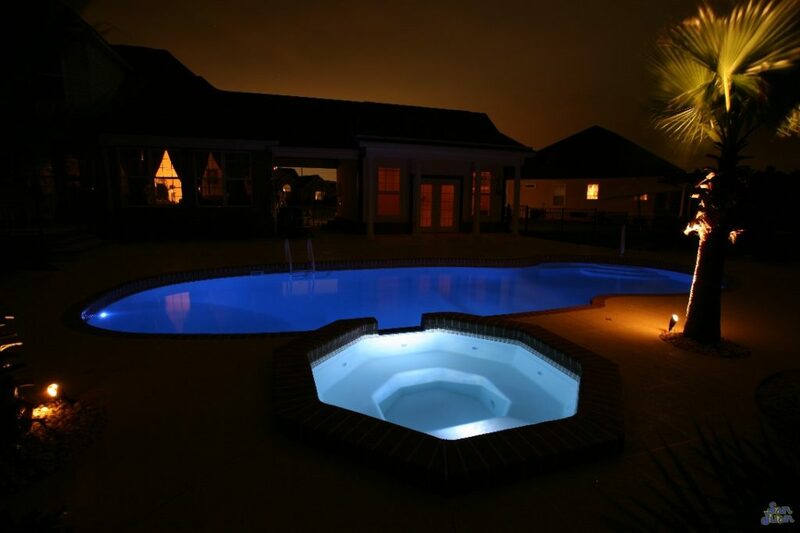 Lastly, we’d love to contact you and provide you with more information about our amazing selection of fiberglass swimming pools. Our teams are always hard at work in the field installing these beautiful babies! 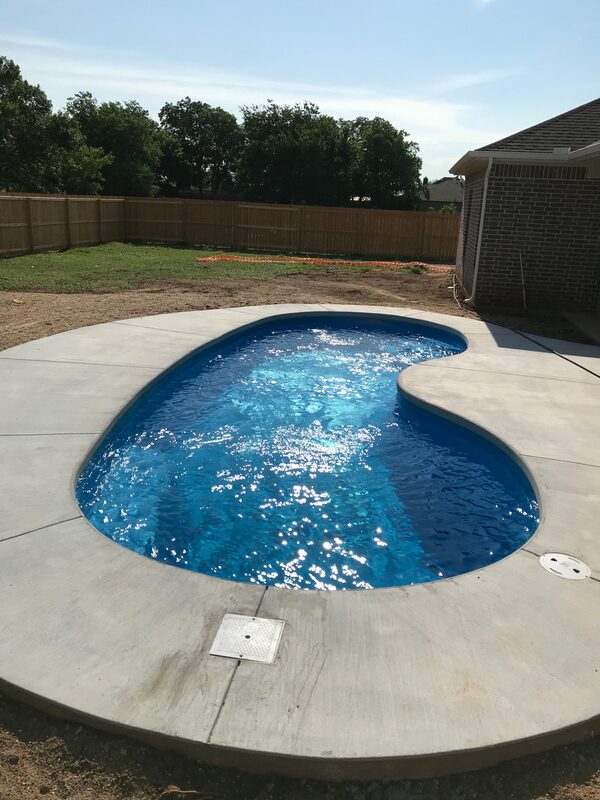 We also love talking about how fiberglass is so much better than gunite and we are sure that you’ll see what we mean after our first discussion. That being said, please feel free to always give us a call or fill out our contact us form! 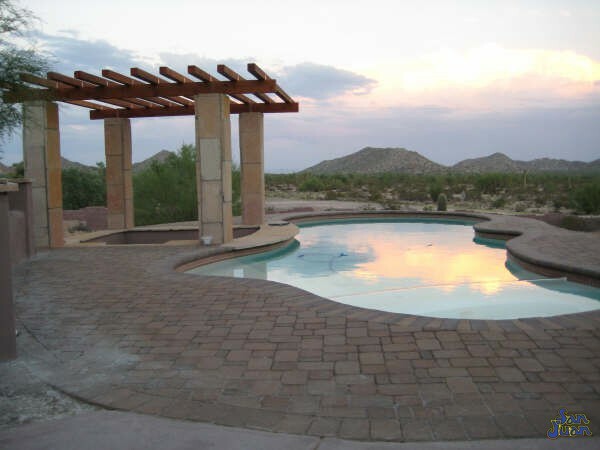 The Desert Springs – Wild Free Form Design! 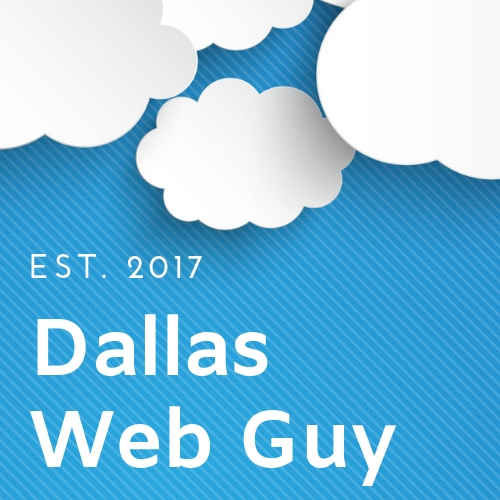 Article written by Dallas Web Guy LLC – a local Dallas/Fort Worth business formed in September 2017. Our goal is help “Small Businesses Grow” and we do not deviate from this path! within Italy and Greece, where they utilize every space available, including walls.